Empires rise and fall. In the buffer areas and crossroads between civilizations, however, a clever ruler can sometimes adopt new ideas, establish trade, and found a city-state - such as the great Phoenician cities of Tyre and Sidon - that will outlast many neighbouring empires. 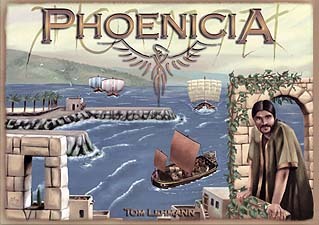 Phoenicia is a strategy game of bidding and development. Each player rules a settlement located on the shores of the Fertile Crescent, in the Middle East, more than 3,000 years ago. During play, you spend wealth to expand your settlement, adding tiles and tokens to it. The first player to successfully found a city-state wins! This is an economic auction game which has its roots in a game called Outpost and Scepter of Zavandor, but here the gameplay is much streamlined and despite the rulebook is pretty straightforward to play. Players start with a training ground with an untrained worker, and two jobs: hunting and farming. As the game progresses, workers are trained, you then buy tools for them and employ them in the various jobs, which produce money every turn as well as being worth points at the end. Buying better tools lets the workers leave their current job and move to a new one, leaving their old tools behind so that more trained workers can pick up and use those tools. Each round, development cards are auctioned which give different bonuses, such as extra money, new jobs, job upgrades or VPs. The game rewards long term planning, with lots of options. Money can be tight as money is needed to make more money, so has to be managed well. For a game that lasts under 2 hours it manages to cram an awful lot of game into it.